Book Krilo tickets early and avoid disappointment! At the season’s peak, smart travelling and advance booking are the key to getting what you want. At the peak of summer, the best liaison between Dubrovnik and Split – Krilo catamarans – get fully packed every day. So, to travel the Croatian south happily, get Krilo catamaran tickets early at Dubrovnik Travel Corner. Summer is in full swing at Croatia’s south and heats are peaking, just like traveller enthusiasm. After enjoying the splendid, but bustling Dubrovnik, many choose to head up the coast and explore some of Croatia’s 1200 islands. The best way to do it? Krilo Star catamaran lines. Connecting Dubrovnik with destinations like Korčula, Mljet, Makarska, Hvar, Bol and Split, Krilo is by far the best option for travelling between southern hotspots in a fast and convenient way. Not to mention it is often the only direct option between these destinations, and a border-free one, nonetheless. Hence, it might not come as a surprise that Krilo lines get super-busy and are often sold out. 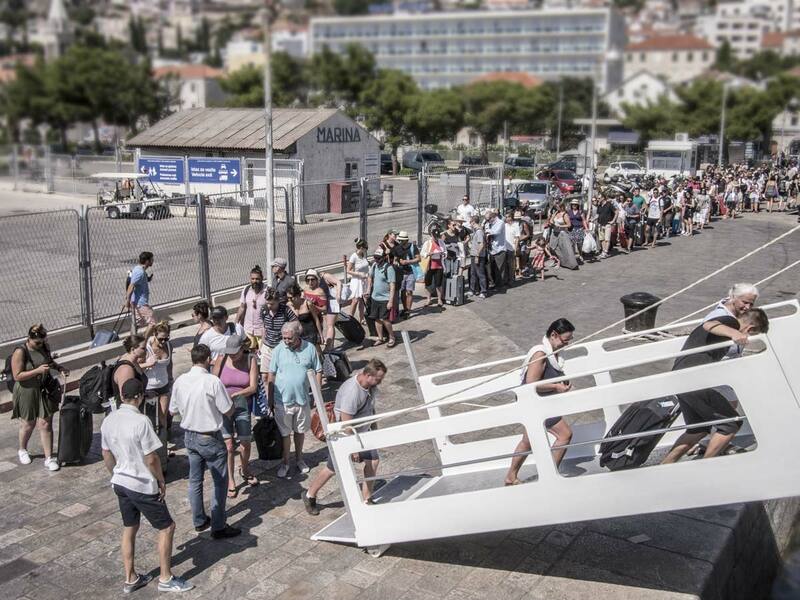 Through the window of Dubrovnik Travel Corner, we see travellers forming lines to embark Krilo catamarans every day. Still, very often, when people come into our agency to buy tickets, we regretfully have to inform then that all boats for the day are full and there are no last-minute tickets available. This is so common in July and August, that we now advise you to get tickets even days in advance. At the season’s peak, smart travelling and advance booking are the key to getting what you want. Drop by Dubrovnik Travel Corner a day or a few days earlier and get your Krilo tickets! On the day of your departure, once you’ve checked out of your accommodation, just drop your luggage off with us and enjoy your last hours in Dubrovnik completely relaxed! Drop by Dubrovnik Travel Corner a day or a few days earlier and get your Krilo tickets!